Junior Rookie is for 5-7 year olds. This is the age when they start to play games and travel to other centers. Junior Rookies play 12 games in the regular season (6 home and 6 away). 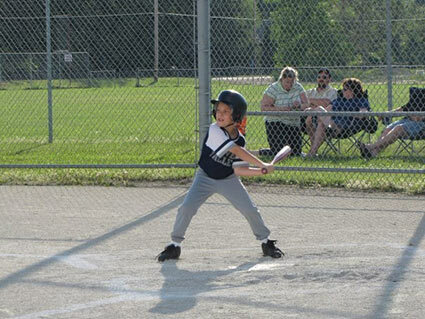 Practice starts in April or May when the weather is warm enough and games begin at the end of May. The regular season games run through July with an end of season tournament at the end of July or beginning of August. The kids get to hit the ball from a pitching machine, so there is no danger of getting hit and the pitches are consistent. There are changes made to the rules of the game to allow the children at this age to develop their ball skills. All players get to bat regardless of the number of players on the team (this is true for all divisions). All batters get five strikes before they are out. There are only 4 runs allowed per inning or 3 outs whichever comes first. They play 5 innings or 1.5 hour time limit, whichever comes first. The kids at this level get a lot of chances to hit the ball and quickly develop good batting skills, they also get to practice their fielding as there is no stealing allowed and no running on an overthrow. It's a great atmosphere for the kids as their team mates and parents cheer them on, whether they get a hit or not. The Junior Rookies start to learn how to work as a team and start to develop better concentration as they learn to keep their eyes on the ball at all time.